Soka Gakkai International (SGI) is a worldwide network of lay Buddhists dedicated to a common vision of a better world through the empowerment of the individual and the promotion of peace, culture and education. There are currently more than 12 million SGI members in 192 countries and territories around the world. The members integrate their Buddhist practice into their daily lives, following the Lotus Sutra based teachings of Nichiren Daishonin, a 13th-century Japanese Buddhist priest. Just as the lotus blooms in a muddy pond, all people can manifest the Buddha nature – inner resources of courage, wisdom and compassion that can equip them to overcome life’s challenges and lead happy and fulfilling lives. As engaged Buddhists, SGI members aim to create value in any circumstances and contribute to the well-being of others. Their practice sparks a process of ongoing inner transformation and empowerment known as human revolution. The promotion of peace, culture and education is central to SGI’s activities. SGI members perform a morning and evening practice known as gongyo, which consists of chanting Nam-myoho-renge-kyo and reciting portions of the Lotus Sutra. The duration of any particular chanting session is up to each individual. This regular morning and evening ritual is the basis of daily practice, a time when one can reflect on priorities in life and connect with the deeper rhythms of life. Please click here to find out more about the practice of Nichiren Buddhism. There are SGI members in 192 countries and territories and 84 registered constituent SGI organizations. Please click here for the list of SGI centers open to visitors. As third president of the Soka Gakkai (value-creating society) and founder of SGI, President Ikeda is a Buddhist leader, peacebuilder, a prolific writer, poet, educator and founder of a number of cultural, educational and peace research institutions around the world. 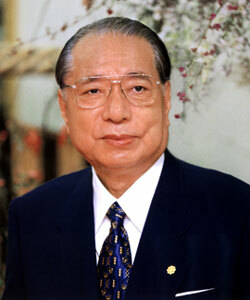 President Ikeda is a firm proponent of dialogue as the foundation of peace. Since the 1970s he has pursued dialogue with a wide range of individuals around the world in political, cultural, educational and academic fields. Over 50 of these have been published in book form, with people such as Mikhail Gorbachev, Elise Boulding, Joseph Rotblat and André Malraux. In furtherance of his vision of fostering dialogue and solidarity for peace, President Ikeda has founded a number of independent, nonprofit research institutes that develop cross-cultural, interdisciplinary collaboration on diverse issues: the Boston Research Center for the 21st Century (renamed the Ikeda Center for Peace, Learning, and Dialogue in 2009), the Toda Institute for Global Peace and Policy Research and the Institute of Oriental Philosophy. The Min-On Concert Association and the Tokyo Fuji Art Museum promote mutual understanding and friendship between different national cultures through the arts. President Ikeda is a prolific writer who has published more than 100 works, ranging from Buddhist philosophy to biographical essays, poetry, children’s stories and photographic collections. Please click here for his biography. Source: Soka Gakkai International and Daisaku Ikeda – Buddhist philosopher, peacebuilder and educator.